Newsies, the Broadway musical, got a much happier reception than Newsies, the original 1992 flop Disney film. It also get a major new female character. We talk with the Houston actor who plays her in the tour at the Winspear. Original company, North American Tour of NEWSIES. ©Disney. Photo: Deen van Meer. These song lyrics have been stuck in my head since I was eight years old — as have the dance moves from Newsies. I loved every little bit of that Disney movie about a bunch of rag-tag newsboys striking against the inhumane and irresponsible business practices of the newspaper industry. Everything from Jack Kelly (a young Christian Bale) and his dreams of going to Santa Fe to that scene in the newsroom when the newspaper boys — the “newsies” — swing from ceiling fans. And don’t think I didn’t try that at home, much to the chagrin of my parents. The 1992 film was based on the real-life strike of New York City newsboys conducted after Joseph Pulitzer, publisher of the New York World, raised the cost of newspapers for the newsboys to buy and sell, all to one-up his competition at the boys’ expense. Now, the national tour of the Broadway musical comes to Dallas and the Winspear Opera House, April 29-May 10. The Broadway show opened in 2012 and won Tony Awards for its music, lyrics and choreography. That’s a very different reception than the original film had; it flopped and only became a hit when it went to video and was streamed online. Now the film I grew up watching — watching until there were holes in the videotape — is a cult favorite. With something so beloved, you take a risk in creating a new life for it — and adding new characters. One of the new characters the musical has birthed is Katherine Plumber, a young reporter who becomes of particular interest to our hero, Jack Kelly. Katherine is actually a combination of Bryan Denton, the news reporter who helps lead the newsies. and Sarah, Jack’s love interest. But she’s also one who has the ability to become a role model. She is educated, strong, independent and a hard-worker; she can keep up with the boys, actually beating them at their games. For the first national tour, she is played by Stephanie Styles, a recent graduate of the University of Michigan and a native of Houston. Styles took time to talk to me about life on the road and becoming her character. 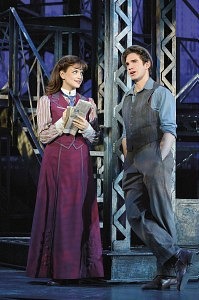 Stephanie Styles (Katherine) and Dan DeLuca (Jack Kelly). Original North American Tour company of Newsies. ©Disney. Photo: Deen van Meer. When did you first fall in love with theater, and what made you focus on musical theater? SSI first fell in love with musical theater when I saw the national tour of The Phantom of the Opera at Jones Hall in Houston at the age of four. But I think my love for the medium had always been there because I’d always loved the Disney animated movie musicals. They had these fantastic songs that propelled the story. That’s what made me love musicals: the use of song, dance and a solid book to tell a story. It must be like a dream come true to be a part of a Disney classic and to be a part of the first national tour of a Tony-award winning play. How has the process been for you in creating Katherine, a new character for those of us who grew up watching the film version of Newsies? SSIt is a dream come true especially since I’m such a huge Disney fan. I’m a charter member of the official Disney Fan Club D23! What’s interesting about Katherine is that she is not in the film. It’s a thrill to play such a determined, spunky and courageous girl who goes through such a transformation in the few days that our story takes place. Do you feel any pressure from fans of the original staged production, and even the film, to play Katherine a certain way? SSOur director, Jeff Calhoun, is fantastic because he really helped me in developing Katherine. It’s fun when fans of the film see the show. I love to get their take on this new character that they don’t know. I just love finding the truth in Katherine and focusing on what it would really feel like to be a young girl from a certain walk of life who is so passionate about helping this young men and their leader although they come from a world so far from her own. Can you give us a brief description of what it is like to be on tour? What does a “normal” day consist of? SSI always ask the local crew for a list of their favorite places to eat! I’m a big foodie. I also love indoor-cycling, so I try and find that in any city I can. My typical day includes sleeping, press for the show, working out, exploring the city and then I’m off to the theater to do Newsies! 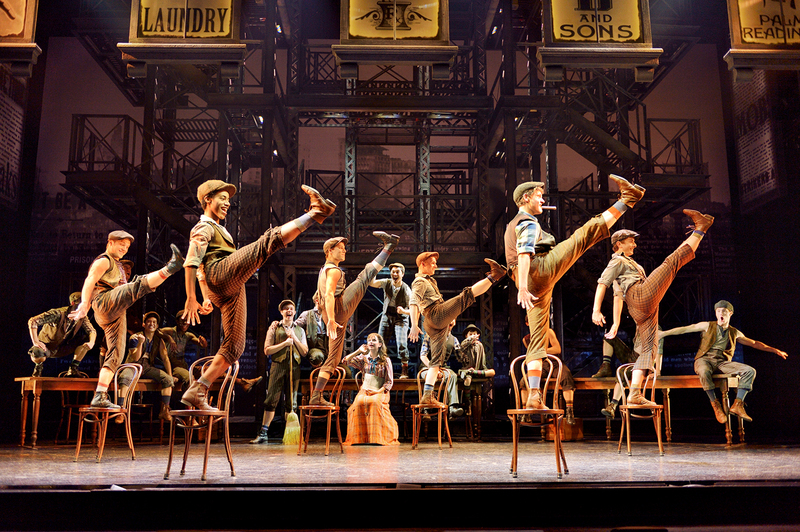 What has been your favorite experience of working on Newsies so far, and being on tour? SSGetting to tell this fantastic story every night and getting to be a part of the Disney family is an honor. I love exploring the country with this amazing group of people and meeting all the fans of our show. Their passion for our show fuels me. Every experience with Newsies is a memorable one and I’ll treasure them always. Newsies runs through May 10 at the Winspear Opera House.